England delivered the expected easy win over San Marino at Wembley to maintain their 100% start to the Euro 2016 qualifying campaign. Manager Roy Hodgson has been handed a highly favourable draw in Group E as England attempt to banish the memories of their miserable World Cup - and they are taking full advantage so far. Phil Jagielka headed England in front and Wayne Rooney scored his 42nd England goal from the penalty spot before half-time as San Marino presented barely any serious competition. Danny Welbeck, the two-goal hero of the opening win in Switzerland, added the third before substitute Andros Townsend got in on the act and Rooney saw his cross deflected in by Alessandro Della Valle. The scoreline matched England's win here in October 2012 and Hodgson's men now move on to face Estonia on Sunday as they attempt to make it three wins out of three. San Marino's right to a place at this level - they are joint bottom with Bhutan at 208th in the Fifa world rankings - has been questioned, and nothing happened here to suggest they can ever be a going concern in international football. Apart from the odd piece of token resistance - and the antics of keeper Aldo Simoncini - this was another unsuccessful exercise in damage limitation. England's record over them is now an aggregate 31-1 from five meetings. For Hodgson and his players, this was job done in front of a highly respectable attendance of 55,990 and the impression remains that there would be the biggest inquest in England's football history should they fail to progress from this group. Rooney's penalty moved him to 42 England goals, seven shy of Sir Bobby Charlton's national record, and the 28-year-old thought he might have added number 43 - but his second effort took a heavy deflection and went down as a Della Valle own goal. The game quickly settled into the expected pattern, with San Marino penned in their own half, but the visitors survived until the 24th minute when Jagielka rose to head in from a corner as keeper Simoncini stumbled in a melee. England goalkeeper Joe Hart, as usual in these matches, was little more than a spectator, although he was kept interested by a 20-yard shot from Matteo Vitaioli that flew wide, an occurrence so rare it drew warm applause from the Wembley crowd. 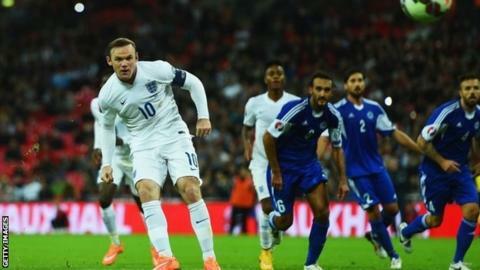 Rooney earned and scored the spot-kick that put England further ahead just before half-time. Andy Selva raised his boot, and the Manchester United keeper drove in powerfully from the spot to set up the second half perfectly for the home side. Hodgson made a double change at half-time, sending on Alex Oxlade-Chamberlain and Adam Lallana for Liverpool pair Raheem Sterling and Jordan Henderson. Oxlade-Chamberlain made an instant impact with a run to the by-line and cross that Welbeck turned in neatly at the near post. Rooney was getting the opportunities to add to his first-half goal but he found the eccentric Simoncini in defiant mood, saving three times from the England captain in quick succession. It was another substitute, Townsend - on for Welbeck, who added to England's tally after 72 minutes when his powerful shot beat Simoncini at his near post. San Marino were simply trying to keep the score down but could not quite see out the rest of the game as Rooney's effort took a heavy deflection to complete the scoring. Match ends, England 5, San Marino 0. Second Half ends, England 5, San Marino 0. Attempt blocked. Andros Townsend (England) left footed shot from outside the box is blocked. Assisted by Alex Oxlade-Chamberlain. Foul by Calum Chambers (England). Lorenzo Gasperoni (San Marino) wins a free kick on the left wing. Offside, England. Andros Townsend tries a through ball, but Adam Lallana is caught offside. Danilo Ezequiel Rinaldi (San Marino) is shown the yellow card for a bad foul. James Milner (England) wins a free kick in the defensive half. Foul by Danilo Ezequiel Rinaldi (San Marino). Foul by Lorenzo Buscarini (San Marino). Attempt blocked. Andros Townsend (England) right footed shot from the centre of the box is blocked. Assisted by James Milner. Substitution, San Marino. Danilo Ezequiel Rinaldi replaces Andy Selva. Attempt missed. Wayne Rooney (England) right footed shot from the right side of the box misses to the right. Assisted by Jack Wilshere following a corner. Attempt blocked. Kieran Gibbs (England) right footed shot from the left side of the box is blocked. Assisted by James Milner. Corner, England. Conceded by José Adolfo Hirsch. Attempt saved. Wayne Rooney (England) header from a difficult angle on the left is saved in the bottom right corner. Assisted by James Milner with a cross. Corner, England. Conceded by Manuel Battistini. Attempt saved. Wayne Rooney (England) header from the left side of the box is saved in the top centre of the goal. Assisted by Andros Townsend with a cross. Corner, England. Conceded by Lorenzo Gasperoni. Attempt missed. Wayne Rooney (England) right footed shot from outside the box misses to the right. Assisted by Jack Wilshere. Own Goal by Alex Della Valle, San Marino. England 5, San Marino 0. Attempt saved. Adam Lallana (England) left footed shot from outside the box is saved in the centre of the goal. Assisted by Jack Wilshere. Attempt saved. Andy Selva (San Marino) right footed shot from a difficult angle and long range on the left is saved in the top centre of the goal. Substitution, San Marino. Lorenzo Buscarini replaces Mirko Palazzi. Mirko Palazzi (San Marino) wins a free kick on the left wing. Goal! England 4, San Marino 0. Andros Townsend (England) left footed shot from outside the box to the bottom right corner. Assisted by Alex Oxlade-Chamberlain. Attempt saved. Jack Wilshere (England) header from the centre of the box is saved in the bottom left corner. Assisted by Andros Townsend with a cross. Corner, England. Conceded by Aldo Junior Simoncini. Attempt saved. Wayne Rooney (England) right footed shot from the right side of the box is saved in the top right corner. Assisted by Calum Chambers. Attempt missed. Wayne Rooney (England) header from the centre of the box is too high. Assisted by James Milner with a cross following a corner. Corner, England. Conceded by Mirko Palazzi. Attempt blocked. Wayne Rooney (England) left footed shot from the centre of the box is blocked. Substitution, England. Andros Townsend replaces Danny Welbeck. Substitution, San Marino. Lorenzo Gasperoni replaces Luca Tosi. Offside, England. Alex Oxlade-Chamberlain tries a through ball, but Adam Lallana is caught offside. Attempt saved. Wayne Rooney (England) right footed shot from outside the box is saved in the centre of the goal. Assisted by Jack Wilshere with a through ball. Attempt blocked. Gary Cahill (England) right footed shot from the centre of the box is blocked. Assisted by Wayne Rooney.